The images in travel brochures depict bikini clad beach holidays as the ideal antidote to the English gloom. However, you can’t always guarantee hot weather in some of the places that the summer sun winter holidays are set. 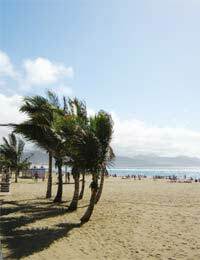 One good example of this is the Canary Islands - a classic winter sun destination. Although the Islands are considerably warmer than the UK in mid-winter, the temperatures are often only around 18-22 degrees, so it’s not always bikini weather. Nice for a bit of warmth but you won’t be able to work on your tan. Asia provides an almost ideal backdrop for a hot holiday in January or February, as the climate is perfect. Some suggestions for ideal holiday hotspots are Burma, northern India, the Philippines, western and southern Sri Lanka, or Nepal. The sun is great in Nepal during the day but it can still get cold at night if you’re high up. In Thailand, too, Phuket will be dry and sunny from January to March, but take care if you’re visiting east coast resorts such as Koh Samui as it tends to be a lot drier in February and March there than it is in January. In Africa, take your pick from a trek across the Moroccan desert, a trip across the Maghreb, or a quick visit to Egypt, which are warm, dry and generally not too expensive in the winter. Look out for the deals on offer through some of the specialist companies for trips to Zimbabwe if you want heat with a difference. Although the country still has its political and social problems, the country certainly needs income from tourists, and if you’re tempted, you’ll be rewarded with some amazing experiences that include wild animal spotting in barely visited parks. The continent might not be as hot as some of the other hot winter sun destinations in January and February, but there are still some nice temperatures in parts of America, Argentina, Peru, and Nicaragua. Mexico and the Caribbean can be really gorgeous at this time of the year - Mexico's Mayan Riviera offers some classy five-star accommodation and the tropical climate keeps the region warm and humid all year round, with January temperatures of around 25C. Southern Florida is the best place for winter sun of all mainland America - southern California can be pleasant but isn’t usually that hot until later in the year. Miami is another great bet, with temperatures in the mid twenties and the annual Art Deco Weekend Festival, which runs from January 15 to 17. In Hawaii, be a surfer dude and make the most of the warmth and some gigantic waves. If you really want to go for the heat, a trip to Dubai in January or February could be just the tonic for the winter blues, as it’s said to be just about perfect. The temperature usually hovers around the mid twenties range, and the sun shines almost permanently. You’d be extremely unlucky to get a rainy day at this time of year in Dubai, and if you get bored of the constant perfect weather, just head into one of the amazing, enormous air-conditioned shopping malls. Places that you should think about avoiding in the early months of the year, including the UK of course, include Indonesia, The Seychelles, Polynesia, where they will be going through their rainy seasons, and there’s a high risk of coming across a nasty cyclone if you visit Madagascar or Mauritius.